Apart of this, I am not a big believer in mocktails. Sodas can be fantastic [home made grapefruit soda is fantastic, or homemade ginger ale, ginger beer or any other odd ingredient sodas]. Juices - fine. Lemonades - yes, refreshing and good. And iced teas - can be absolutely amazing. Hence you don't need sickly sweet syrupy juice mixtures. A drink which I got to know long time ago, very early in my career, is a bit a different beast [well - you cannot call an alcohol-free drink a beast really, but you get the point]. I worked in an American bar and restaurant, called Louisiana and this was one of the most popular drinks without booze. Truth has to be told - the Ipanema is also mimicking [at least a bit] an alcoholic drink: the Caipirinha - however it doesn't substitute the cachaça with a booze-tasting ingredient - it just goes into a complete different direction adding the exotic passionfruit. 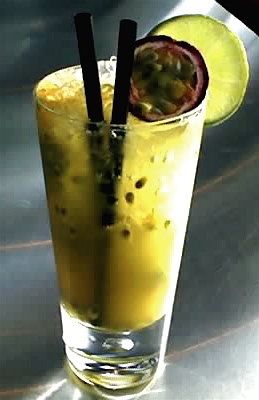 Scoop the seeds and fruit flesh out of one passionfruit and add to a glass. Roll the lime under your palm until it gets softer. Cut the lime into 8 pieces [first half the lime and then quarter the halves] and add to the glass. Add the sugar. Muddle until really juicy and the sugar is almost dissolved. Fill up the glass with ice [full of ice] - cracked ice is fine as well as crushed ice - only big ice cubes don't work here. Add the orange juice and stir. Fill up with ginger ale and stir again to retain the carbonation. Garnish with a passionfruit half and lime wheel. This is my [contemporary] recipe. The original @ Louisiana used passionfruit nectar, which you cannot compare at all with fresh passionfruit [fresh is so much better]. However I had to add fresh orange juice, as the fresh passionfruit is stronger [more acidic and much more concentrated] as nectar - and you can't use that much. Anyway - the drink is so good, that I featured it on all bar menus, I have written since then [and these are quite a lot]. Is it as good as an alcoholic drink? You cannot compare tofu to a ribeye steak - can you? It is just different. But as alcohol-free option, besides of a properly prepared iced tea, lemonade, soda [...] it is definitely fantastic. Much better than your usual mixed fruit juices or sickly sweet juice mocktails. Try it - you will be pleasantly surprised! Glad you're putting an effort into posting non alcoholic drinks! Thanks for commenting guys! Actually I was a bit strained, due to the whole F1 circus in Abu Dhabi [and in my hotel]. @Arwa - I am actually drinking very less - however I usually don't put a lot of effort into what I drink [it is pretty easy and effortless to open a bottle of Coca Cola]. Professionally mocktails are so different than cocktails [it sounds funny - but you have no base, you are building your ingredients around]. @The Hedonista - the perfect match would be cachaça [Sagatiba of a+e is very nice and available here in the UAE or a bit more traditionally Germana - I think of MMi] - which would highlight the tropical notes - you don't need orange juice then, because you will have enough liquid. Or - different but not as nice as the cachaça would be dark rum. Gosling [MMi] is amazing - and you can always make an authentic Dark n'Stormy - but even Old Monk would be great.